Three Bedrooms, 2 Bathrooms Across The Street From The Beach. Cozy Coastal Cottage where you can relax on the screened porch, swim in the pool, and hop across the street to the most beautiful sandy beaches on the gulf coast. The outdoor jacuzzi, Tiki hut, and bar-b-que area offer you a place to enjoy the outdoors. The cottage is located next to the Bon Secour National Wildlife Refuge and is down the road from Historic Fort Morgan, the ferry to Dauphin Island, and the Dauphin Island Sea Lab. Enter through the screened porch to a large living, dining, and kitchen area. There are three bedrooms with 1 king bed, 1 queen bed and two sets of bunk beds (Sleeps 8-10). There are 2 full baths with a full size washer and dryer. 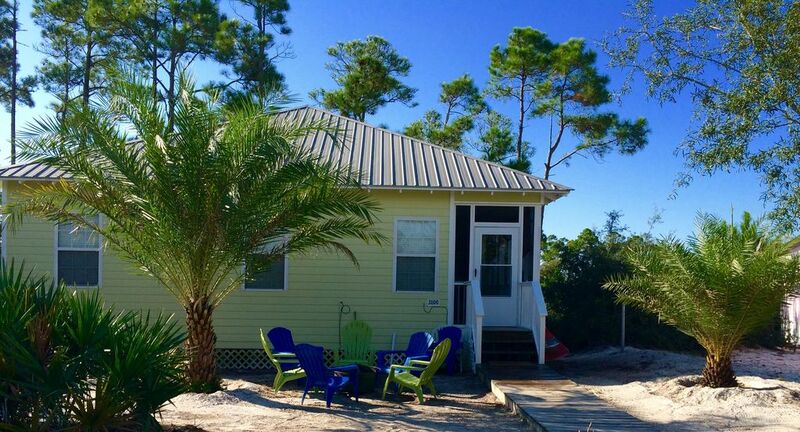 The "Shoot the Moon" cottage is the perfect place to enjoy all the wonders of the Gulf and the surrounding areas. My wife and I enjoyed this wonderful place for a few days. It is everything that was in the description and much more. Though the pictures of the place are great, seeing it is even better. We will be returning and staying considerably longer next time, and yes, there will be a next time; that's how good this place and Theresa are. Property was clean, well kept and relaxing. Quiet, peaceful retreat. Pool and hot tub were perfect. The kids loved it! Beach was peaceful and clean also. Use of golf carts were a plus for hauling stuff to beach and just cruising around. Enjoyed it so much the first two days we asked to add on an additional night to our 7 night stay already. It was awesome. Our family, along with another family, rented this house for the week. It was right across the street from the tennis court and pool. The beach was a short drive away. We did experience a little problem with the AC (a coil needed replacing) but the owner and property manager went above and beyond to get it fixed quickly and to make sure we were comfortable until the AC company could come. The house was clean. The beds were very comfortable. The kitchen was stocked with all the necessary dishes. The washer and dryer were a huge help. There were TVs in every room, all which worked perfectly. There were games to play and movies to watch. I highly recommend this house. This house is everything we were looking for for our family vacation. It comfortably house two separate families (nine people total – four adults and five kids). We loved the homey atmosphere, access to the beach, the pool, lots of games for the rainy day that we had, and so much more. We would absolutely recommend this home to all of our friends that visit Gulf Shores. Beautiful, perfect family cottage, just like home! The property is clean, great location to beach, pool, fresh seafood, and still enough away from the hustle to be very family oriented. This is our FAVORITE place to stay. We had 2 families of 4 stay at the property. Our 4 children were 9 months, 19 months, 2y/o and 4y/o. There was plenty of space. The sand in the front yard was a plus. We put an easy up in the yard with a small pool and sprinkler for the kids to play while we were grilling. The beach ride on the golf cart is very short (2-3 minutes). The pool is excellent for young kids. The property owner was fantastic to deal with. We would definitely stay at this home again.